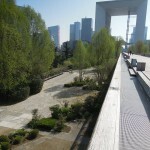 In Paris, the landmark district “La Défense” with its skyscrapers and the monumental Grande Arche building can be seen from almost anywhere in the city, similar to the Eiffel tower. 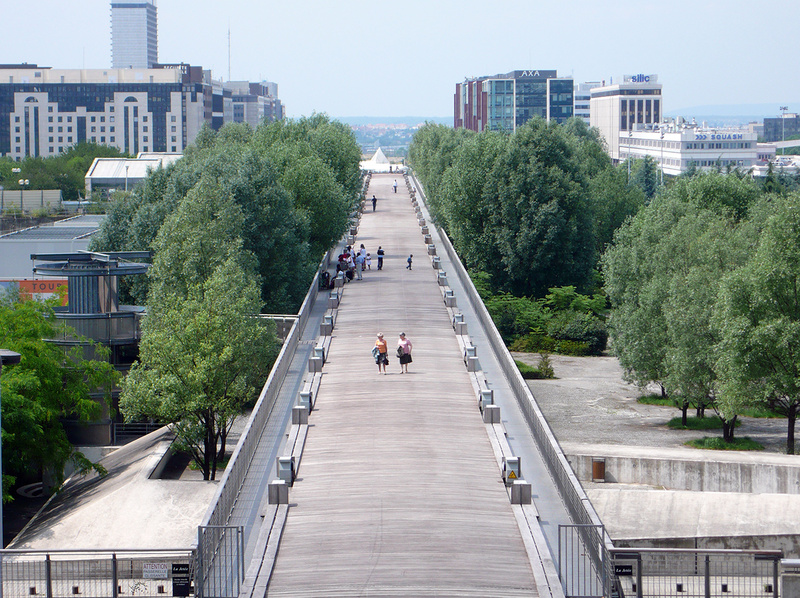 It’s mostly a business district (technically just right outside the city borders of Paris) whose construction started in the late 1950s. 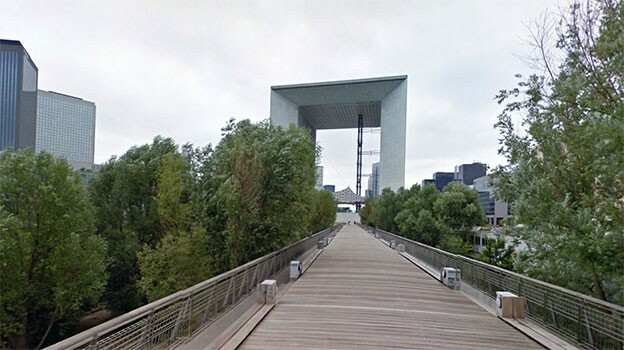 Today, La Défense is a strangely unreal place: like with most high rise and business outskirts in european cities, the place is crowded almost only during commuting and work break hours. 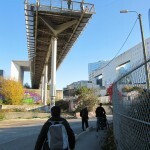 Then, hundreds of people fill the car-free esplanades, occupy the benches and sit in restaurants or coffee shops. Outside of these hours, I’ve discovered the place lonely and deserted. Nevertheless, I still love it. 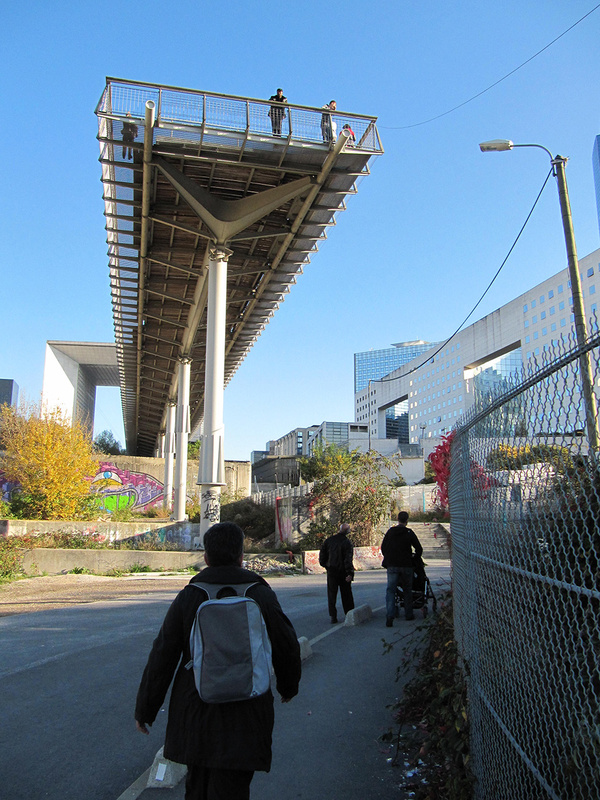 It seems like the urban planners and architects had other ideas on their minds, but it just didn’t work out for some reason. Still, a lot of aspects of the place seem to have been made explicitly with people in mind: Lots of green spaces, plants, wells and small lakes, places to relax and just sit and watch the world walk by. 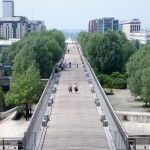 One of these things is a 450 meters long wooden jetty, named “La Jetée” in french, which runs from behind the Grande Arche into the wastelands beyond La Défense. 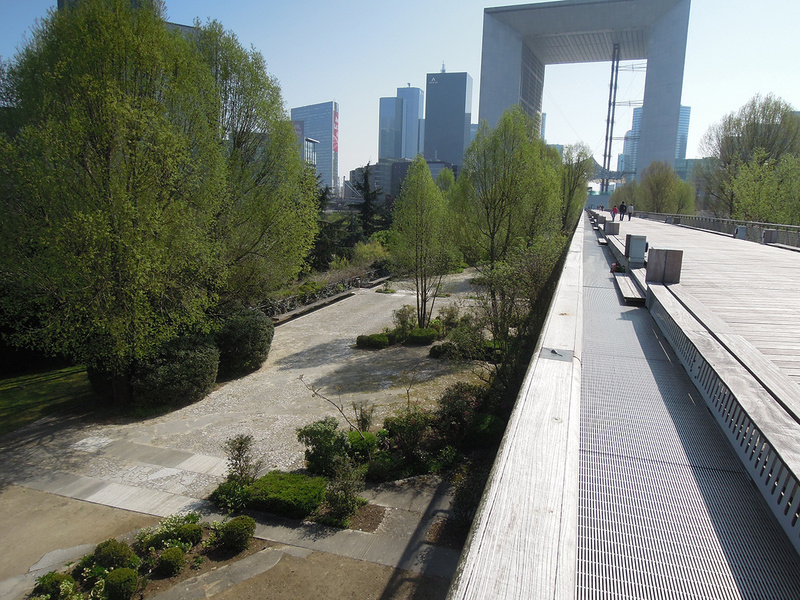 Below the jetty, there’s a tranquil graveyard which adds another layer of stark contrast to the business district of La Défense. The jetty simply is there. It serves no purpose, nor is it a passage connecting places of interest. 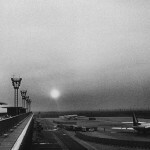 And the few times I’ve been there, I found it to be completely abandoned. 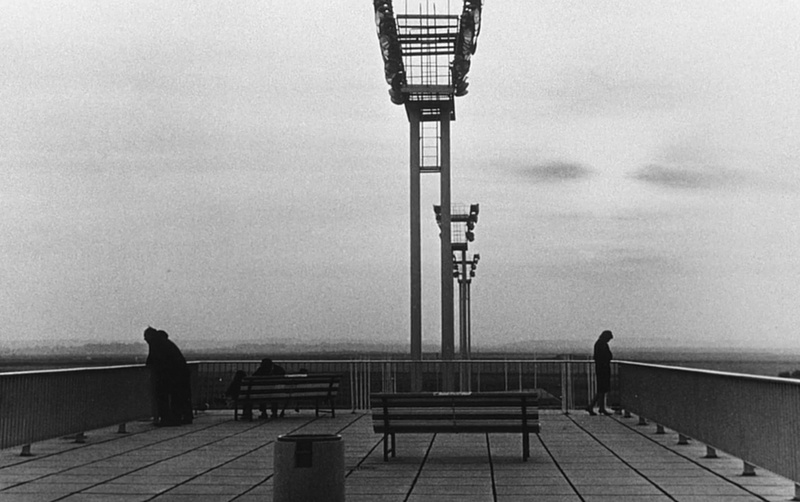 The wooden jetty shares the french name of “La Jetée” with Chris Marker’s masterpiece science fiction film, an (almost) black-and-white movie consisting (almost) only of still images. It gained some mainstream attention as being the source of inspiration for Terry Gilliam’s Hollywood movie Twelve Monkeys. 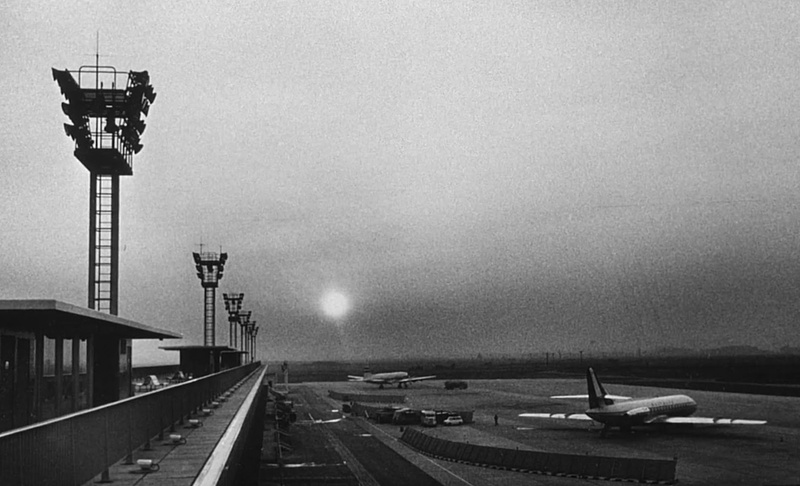 Chris Marker’s Jetée is located around 30km from La Défense, at the terminal of the airport of Orly, one of the two big Parisian airports. 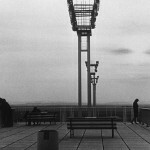 To me, apart from sharing the same name, there’s a kind of connection between the two places. They both have a feeling of dystopia and melancholy to them – and time plays a major role. To me, the architectural language is similar as well, but maybe that’s just my impression. A hyperlink in my mind. L’organisation de la Vue: Un jeu de co-visibilités, co-surveillance?